G.T. 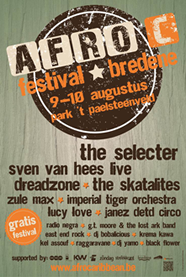 Moore and The Lost Ark Band will be playing at the Afro C Festival, Bredene (Belgium) on Saturday the 10th of August at 18h on the Marquee Stage. Also playing the festival this year are the famous Skatalites and many other bands! Free Entrance! Check out their website for more information.